When you are losing a match in FIFA 2007, press start and go to “Select Sides”. Switch to the other team, then shoot at your own net and score goals for your original team. Once your original is winning by a comfortable lead, switch back. When taking corner in FIFA 2007, press R2 to call the player to pass it and cross. Make sure it curls outward and aim for the penalty spot. When you have the ball with a winger, check in field when near the byline, then dribble across goal before shooting. You rarely get tackled and can score at will. When coming up to the box, instead of running, walk. There will be no tackle from the other team. Shoot when you reach the edge of the box with L2 and Circle. When running up to the goal, pass to the nearest player and then shoot. The keeper won’t dive and he’ll just miss the ball. Try this on practice mode. When you start off from kick-off, just hit the shoot button to full power and aim at goal but be careful not to put and curl/spin as this will take the ball away from the goal post. This does not always work, but when it does, you’ll see the keeper scramble for the ball. If you want to score an overhead kick, cross it in from the right wing and hold down L2 and press circle. It works best with created players, Wayne Rooney and Andriy Shevchenko. This entry was posted on Monday, December 18th, 2006 at 10:46 am	and is filed under Funny Video Clips. You can leave a response, or trackback from your own site. 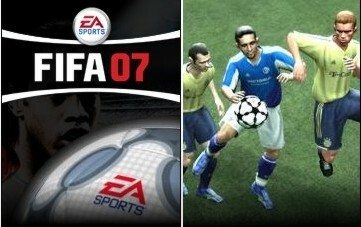 8 Responses to "Cheats, tips and hints for FIFA 2007 game"
i want to be ipswich town! all i can find is the top league for any countries!? why is that? why can`t i find any teams from cyprus? PLZ TELL HOW TO SWING THE BALL DURING ANY KICK AND ESPECIALLY FREE KICK!